If you’re the type of sustainability supporter who’s interested in understanding all of the many facets of sustainability—as opposed to focusing on special areas of expertise—you’ll enjoy associating with other like-minded, ‘big-picture’ thinkers. Many worthwhile organizations cater to people with special interests, including climate change, wildlife, resources, renewable energy, social equality, agriculture, population, and economic areas. But there are very few people—even in the sustainability movement—who demonstrate interest in grasping a big-picture view of how various aspects intersect and influence one another. Representatives of three local organizations—Weathering The Storm, World Population Balance, and Sustainability Education Forum (affiliated with Citizens for Sustainability)—are partnering in co-sponsoring the upcoming Sustainability Forum: Threats and Opportunities. The primary objective is to provide a pilot-project forum that, in addition to convening members of the greater Twin Cities’ sustainability community, will also introduce these three organizations, and others represented at the forum. The overarching purpose of an educational forum is to provide study opportunities for gaining big-picture insights—in addition to providing opportunities for networking, The idea is to begin with connecting leaders in the sustainability community, and, as expertise develops, increasingly involve the general public with educational opportunities. 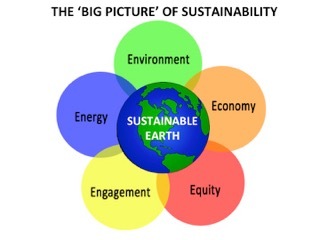 Specifically, we wish to explore the complex interrelationships and interconnections of the three Big E’s: Environment, Energy, Economy, in conjunction with at least three sub E’s: Equality/Equity, Enlightenment, and Engagement. A major premise is that having expertise in a single area (one E)—while ignoring the many other areas of concern (the other E’s)—is simply not sufficient in an extremely complex world faced with a series of converging crises. Interrelations between the E’s may range from subtle to blatantly obvious. For example, the implications of burning fossil fuels are well known, as increased pollution and rising CO2 levels ultimately lead to global warming and climate changes. In sum, depending on how the sustainability community responds to this pilot-project forum, we may be able to form an association of big-picture sustainability supporters. We intentionally planned this event to kick off 2017 on a positive sustainability trajectory. At this crucial time in world (and U.S.) history, when the future of civilization and life on this planet hangs in the balance, and political leadership is swinging increasingly to the authoritative right, it’s time for well-intentioned people to step up to the plate. Hoping that “others” will take care of our collective problems will not get the job done. So, if you’re available, please attend this unique forum. Since seating is limited, please register ASAP, by emailing me at warex001@umn.edu, We sincerely hope to see you ! > Peak Prosperity: As We Enter 2017, Keep The Big Picture In Mind (Chris Martenson). As bluntly as I can say it, anybody who found the level of disruptions on 2016 overwhelming is going to have a hard time navigating the future. The period of adjustment has only just begun. Perhaps the most vexing challenge remains how to more effectively communicate the various predicaments and problems we face. For one, the profound lack of investment in oil development will have a future impact on supplies, so look for a big upside movement in oil prices somewhere between 2018 and 2021 (with war/conflict in the Middle East or with Russia being an immediate upside catalyst that could happen at any moment). This is going to be a pivotal year, and I want to inspire and challenge this community to find new ways to work together to help more people understand what’s truly at stake—the future prosperity of the entire world. > News Grio: Progressives See A Leader In Bernie Sanders As They Prepare To Fight Back (Stanley Ward). Some Sanders progressives now see Trump’s victory as a validation of the populist agenda Sanders championed during his campaign. Sanders’ first priority is to elect Keith Ellison, the progressive congressman from Minnesota, as DNC chair. On a tactical level, all eyes are on 2018 and how to elect progressives to seats at the local, state and national level. Alongside public appearances, Sanders also set up the “Our Revolution” organization, which aims to harness the energy that the Vermont senator’s presidential bid created. In the November election, Our Revolution threw its support behind progressive candidates, encouraging people who had supported Sanders to fundraise and door-knock for local politicians. > Counter Currents: As The Sun Sets On The Nuclear Wasteland (Vincent Di Stefano). If we continue to collectively live in ways that are fundamentally damaging to the earth and her creatures, thresholds will be crossed beyond which unpredictable and inevitably damaging consequences will result. This is effectively the story of industrial/technological civilization as it has unfolded over the past century. In addition to runaway climate change, the more disturbing influences to be unleashed over the past century have been the ruinous consequences of seventy years of nuclearization, including the problem of nuclear waste. We have collectively come to understand that the reality of climate change will add further dimensions of uncertainty to a picture that demands absolute environmental and geological stability for long-lived radionuclides that need to be kept isolated from all ecosystems due to their extreme danger to all of life. > Yes! Magazine: It Wasn’t All Bad: 5 Signs Of Positive Change In 2016 (Sarah van Gelder). We are living on a planet with a carbon-saturated atmosphere, in a time of increasing inequality and terrifying violence. Trump’s administration won’t get us where we need to go, but neither would the Democratic Party’s corporate-friendly policies. So, even as we enter a time that could be quite dark, we should focus on how to move forward by nurturing the seeds of real change that began to germinate in 2016. Here are five signs: 1) we gained respect for Mother Earth, as witnessed with the activism at Standing Rock; 2) we learned how to heal violence, again, as evidenced by the non-violent activists at Standing Rock; 3) we acknowledged the leadership of people of color, in dealing with conflicts between police and black men; 4) we embraced a presidential campaign based on economic justice, especially with Sander’s messaging; and 5) we witnessed the start of the fight for real science, and against false information. > Common Dreams: New Study ‘Sounds Alarm’ on Another Climate Feedback Loop (Andrea Germanos). The loss of Arctic sea ice has already been shown to be part of a positive feedback loop driving climate change, and a recent study published in the journal Nature puts the spotlight on what appears to be another of these feedback loops. It has to do with soil, currently one of Earth’s carbon sinks. But warming may lead to soils releasing, rather than sequestering, carbon. The total amount of carbon lost by 2050 from these higher latitude soils could end up being the equivalent of as much as 17 percent of the expected human-caused emissions over this period, the results suggested. The study also directs attention to soil’s climate buffering potential. > Think Progress: Obama Moves To Protect Nearly 2 Million Acres Of Public Lands Before Trump Takes Office (Jerry Rowland). The amount of protected lands in the United States expanded by nearly two million acres last Wednesday, as President Barack Obama designated two new national monuments: Bears Ears and Gold Butte. The Gold Butte National Monument, east of Las Vegas, Nevada is a popular area for outdoor recreation and is home to abundant Native American and historic artifacts. The 1.35 million-acre Bears Ears National Monument in southeastern Utah is one of the most historically rich areas in the U.S., with more than 100,000 cultural and archaeological sites throughout. The area has also been one of the most vulnerable places for grave robbing, looting, and other destructive activities. > Truth Out: Climate Change 2016: The Year The Future Arrived (Bruce Melton). Global warming didn’t really get started in a big way until the 1950s. Today, the warming rate is seven times greater than it was in the 1950s and the carbon emission rate is four times greater than in the ’50s. That same sulfur pollution that caused all the acid rain in the ’60s and ’70s is a global cooling pollutant that hides warming. It’s a very common misconception that some of the warming is natural. The American Meteorological Society’s latest report on weather extremes tells us: “Without exception, all the heat-related events studied in this year’s report were found to have been made more intense or likely due to human-induced climate change, and this was discernible even for those events strongly influenced by the 2015 El Niño.” Human-caused “anthropogenic” influence was documented in 23 of 28 major global geographic regions. > The Guardian: Green News Quiz: How Well Do You Know 2016’s Biggest Sustainability Stories? (Ucilia Wang, Laura Parker, Kerry Eustice). See how much you recall about these sustainability stories: a 16-year fight won to prevent logging in a major rainforest; U.S. pollinator deaths due to a known pesticide; the company debut of a free-meat, plant-base burger in NY and CA; the renewable energy project near a Trump golf course; a high-tech auto company’s move into PV roof shingles; the state recognized for offering overtime pay to farm workers; the fast-food chain that phased out antibiotics in meat products; the tech giant that issued green bonds for renewable energy; the amount of annual subsidies offered oil and gas companies in Canada; and, among 400 companies and non profits that signed the Paris climate agreement, the one major corporation that didn’t sign. Try your skill in answering these questions. > Grist: Here Are The Best Nerdy Infographics Of The Year (Staff). Check out these visual depictions of energy, transit, and infrastructure. Also, this site contains other environmental news, including 2016 Was A Great Year For Wind And Solar, Even If Nobody Noticed, and Here’s Some Of The Best Environmental Writing Of 2016, According To Us. > Grist: Mexico’s Climate Migrants Are Already Coming To The United States (Amy McDermott). Severe droughts, punctuated by intense storms and flooding, are huge environmental challenges for Mexico in the coming century. By 2080, agricultural declines are expected to drive 1.4 million to 6.7 million adult Mexicans out of the country. Most of those people will come to the United States. Right now, the primary factors driving Mexicans to migrate to the United States are better economic prospects or family connections—both of which can be twisted up with climate change. But in Mexico and around the world, climate changes tend to reshuffle populations within borders, too. Worldwide, unpredictable climate will spur movement of the rural, agrarian poor in developing countries, according to the IPCC. Mexico’s climate story reflects a growing global problem. Worsening droughts, floods, wildfires, and rising seas will drive millions from their homes, all around the world. > Green Biz: The 6 Best Sustainability Books Of 2016 (Lauren Hepler). In a year marked by extreme ups and downs on environmental issues, here’s a rundown of what to read on climate, cities and more: 1) “The New Grand Strategy:Restoring America’s Prosperity, Security and Sustainability in the 21st Century”(Mark Mykleby, Patrick Doherty and Joel Makower);2) “Streetfight: Handbook for an Urban Revolution” (Janette Sadik-Khan and Seth Solomonow); 3) “Rancher, Farmer, Fisherman: Conservation Heroes of the American Heartland”(Miriam Horn); 4) “Surviving the Future: Culture, Carnival and Capital in the Aftermath of the Market Economy”(David Fleming and Shaun Chamberlin) 5) “Our Renewable Future: Laying the Path for 100 Percent Clean Energy”(Richard Heinberg and David Fridley); and 6) “Beyond the Energy-Water-Food Nexus: New Strategies for 21st-Century Growth”(Will Sarni). > Ensia: Technology Got Us Into This Climate Mess, And It Can Help Get Us Out—If We Let It (Lisa Palmer interviews Jason Pontin). The challenge in 2017 existed in 1989: the civilizational challenge of climate change. Technology created the problem, and technology plausibly offers ways to ameliorate and manage it. But we have to want to solve the problem. Great civilizational challenge of that scale requires government, academia, business and ordinary people to want to solve it, and I don’t think as a species we are there yet. I think all these things are manageable, because I am an optimist and a technologist. The first step is to admit you have a problem. And the second step for modern society is to say we are all in this together. It is the first time the human race, if it is to solve these problems, which technology has created, is going to have to think as a family, using technology rather than be used by it. > The Hill: Include Nature In Infrastructure To Make America Great (Robert Gardner, Jessica Hellmann). President-elect Trump has promised to rebuild crumbling roads, bridges, airports, water treatment facilities, flood control systems and more across the U.S., an infrastructure windfall that offers many benefits for many people. The best way to make sure infrastructure investments are cost effective, valuable, and enduring is to use a smart mix of built and natural components. This form of engineering combines natural processes with human technologies and uses organisms and ecological processes to produce goods and services and process waste. Infrastructure that mimics and includes nature provides a unique opportunity to capture other important human values, including ecological integrity, sustainability and natural beauty. Infrastructure infused with nature can connect people to one another and to the natural world, increase productivity, and provide living space for other organisms. > Yes! Magazine: From Growing Edible Forests To Banking Heirloom Seeds, Solutions To Keep Your Food Local (Erin Sagen, Araz Hachadourian). Three success stories: First, after launching an initiative to improve health care access and infrastructure at their reservation, Cherokee leaders in Oklahoma started a seed bank in 2006 with the goal of recovering ancestral seeds to preserve their cultural heritage. Second, the Edible Forest Garden at Roger Williams Park in southern Providence proved that growing a lush woodland ecosystem was a possible horticultural task that most urban green thumbs could manage. Initially planted in 2012, the edible garden is designed to mimic the architecture of a forest, with its canopy structure and layers, and can be sustained without human intervention. Third, as Denver faces gentrification and a skyrocketing population, Re:Farm, a backyard gardening movement is designed to help the neighborhood of Westwood build a local economy they can control. > Green Biz: 10 Amazing Uses For Biomimicry In Business (Tamsin Woolley). 2016 has been a long year, with exultant highs and despondent lows for sustainability-minded professionals. As an evolutionary biologist and futurist, I take the long view. Species come and species go, ecosystems change and disturbance brings opportunity. You’ve probably heard of biomimicry—the art and science of observing the living world, distilling strategies that stand the test of time and applying these deep principles to our human challenges. Biomimicry has become a widely recognized, comprehensive methodology for innovation in industries as diverse as agriculture, architecture, manufacturing, transportation, healthcare, software, materials and robotics. Here are the major bio-inspired topical trends: 1) Biophilia; 2) Living Buildings; 3) Future of work; 4) Bio-security; 5) Machine learning and artificial intelligence; 6) Super-organism-inspired algorithms; 7) Material science; 8) Biological manufacture; 9) Carbon-negative manufacture,; and 10) Biologists to serve in R&D labs.